The highways wet, but the air is fresh as I roll down my window waiting for traffic to move. It's not a traffic jam here on highway 20, It's summer construction. Everyone who has ever lived in a mountain area knows the 3 seasons. Fall, Winter and Summer Construction. The light turns green and I follow our little construction generated caravan to Utah Highway 89. In my rearview mirror is a combination of cars and semi-trucks, but also a preponderance of camping trailers. Most are large "toy haulers" that also serve as a camping trailer. I don't mind, I'm also pulling my recently acquired R-Pod trailer. My tiny Toyota FJ has done a better job at pulling the load than I expected. Except for the freeway, speeds around 70 are the limit for me. I'm still getting used to the camping part, but today I had my list of items to pack and food to bring so I was out the door in 1h:15m. I can live with that. I follow the signs to Bryce Canyon, through Panguitch, and turn onto Utah Highway 12. Semi-trucks continue down 89 and there is now only cars and trailers winding through Red Canyon. The high plateau which creates the viewing area for Bryce Canyon has become a destination itself with camping at the high elevation. Cool and refreshing access to activities has become abundant with horse rides, hiking, mountain biking, and the ever popular ATV trail riding. Passing the turn off for Bryce Canyon and beginning my descent past Mossy Cave trailhead, I check my rearview mirror to verify I am alone on the highway. Other cars come and go but the traffic is less congested by two thirds. The wet pavement of Panguitch has turned into puddles of water still standing on the side of the road as I stop to top off the gas tank in Cannonville. 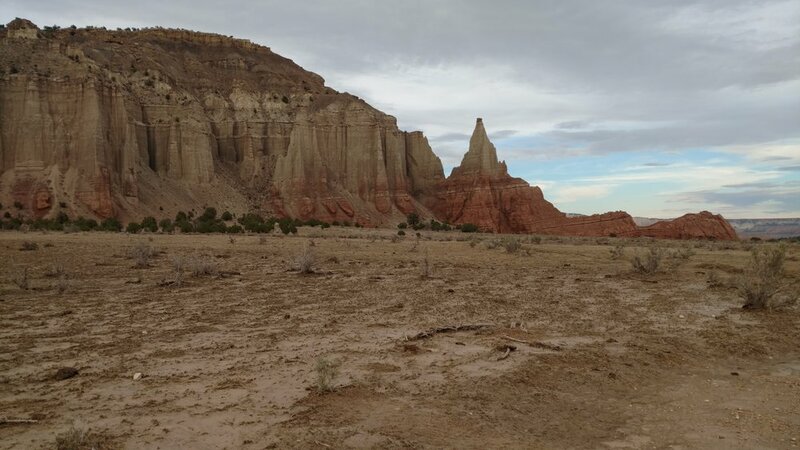 My plan is to dry camp just off Cottonwood Wash road near Kodachrome Basin. I visited Rock Springs Bench a couple months ago and noted the ample dry camping and ATV staging area just off the main road. I would be easy to access on dry roads, now I'm not so sure. It is very evident they had a major storm in the area as I come to the first muddy section of the road. A road crew has already scrapped off the top layer of mud or some of these areas of blacktop would be impassable. Nearing the end of the pavement I realize the Cottonwood Wash road is way to wet and muddy. The road is built on mostly clay soil and is smooth when dry, but clay when wet is extremely slippery. I wouldn't attempt it even without the trailer. 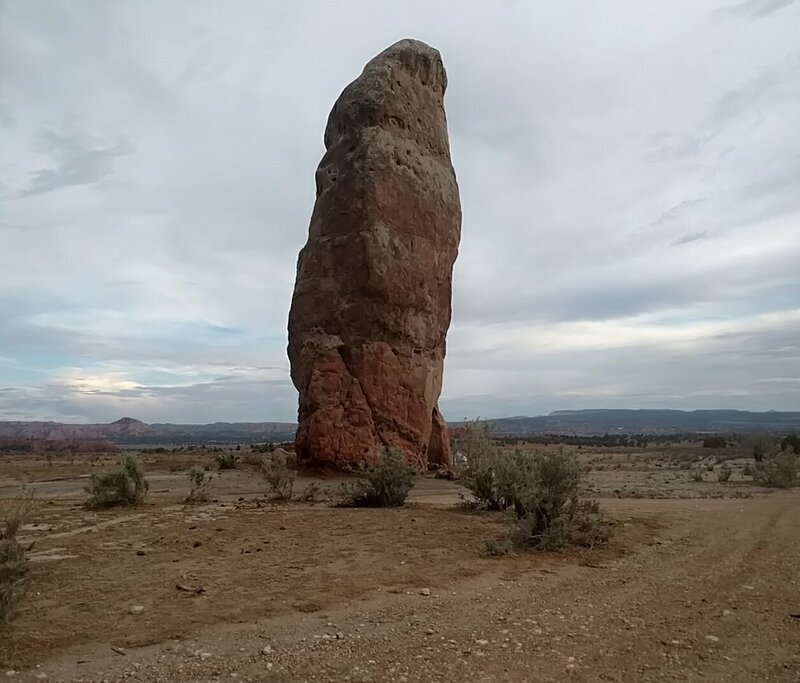 I turn and head to Kodachrome Basin knowing I am here late on a Thursday afternoon with no reservation. "I have 8 spots left" the park ranger said after I approach the gate. "None are Electric" he noted after mistaking my look of surprise that he had any spots left... "and if you don't mind driving down a dirt road". I glance in my rearview mirror again at the dark red swath of mud now caked to the front of my R-Pod behind the tire wells. "Sound's perfect" I said. Bryce View campground must be new. The sites are well thought out and don't sit on top of each other. Arch campground is still under construction but I can see it is also going to be nice. There's a good amount of mud across the road in places as I turn into the campground. Site 46 is my spot and the first site on the right. It's a pull through spot which is nice for trailers and has a fire pit and picnic table among the several Juniper trees creating a nice shady area. I don't have to worry about shade at the moment as the sky is still dark with clouds. According to the Kodachrome Basin trails map my campsite is not far from Chimney Rock and the Shakespeare/Sentinel trail. After a quick afternoon snack I drive down the muddy road to take a look. The rain has brought the temperature down and it feels good at 63 degrees. 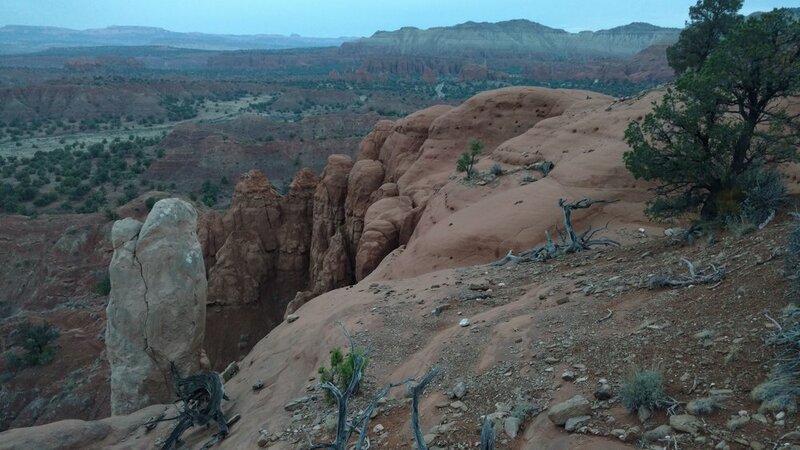 Although Kodachrome Basin is a desert, it sits at 5800' feet elevation, the same elevation as Cedar City. It will be warm on a sunny day, but not excessively hot. Cool at night and I'll be comfortable sleeping with the windows open. It is stunningly apparent at the amount of water that must have been running in the area. A large swath of sagebrush, hundreds of feet wide, have debris among their branches. It's easy to spot the path the water took on its descent down the barren hillside and I'm glad I missed the show. Chimney Rock is a Sedimentary Pipe. According to the state park map and guide. Approximately 67 such pipes exist in Kodachrom Basin and the immediate surrounding areas. Apparently Geologists "are unsure of the exact origin of the pipes" but they all seem to agree that "water-saturated sediments" created pathways through the softer rock and later "re-cemented and became harder than the surrounding rock" Erosion later "removed the softer layer, revealing the pipes". What geologists disagree on and the competing theories between them is "how" the sediment moved through the rock. Earthquake, ancient springs, and water pocket under pressure are the main 3 theories. Regardless on how they were formed, they are magnificent in their rugged strength. Crossing another cattleguard, this one has almost lost the battle with the nearby wash, I turn left and follow the sign to Shakespeare Arch/Sentinel trail. This section of the road is low and it still covered in silt from the runoff. Several tire marks can be seen so I move through the muck. I arrive at the trailhead near dusk. There is plenty of daylight hours left, but the remaining clouds to the west are so dark it is causing an early sunset. The trail is only a 1.7 mile loop and I set off down the wide well traveled sandy route. This is a freeway trail to be sure and I imagine during a calm spring day it sees its share of hikers. Today however I have the trail to myself and smile as I make "first tracks" in the soft rain splattered dirt. The rock formation here are unique and the layering between soft rock and crumbled base remind me of those statues I've seen of people holding up various scenes. Harry Potter "Magic is Might"
The fading light and shadow magnify the effect as I work my way round the bluff. Several side trails exist for pictures and I soon see Shakespeare Arch. The arch is small by comparison to other natural arch bridges that populate Southern Utah in rich abundance (see Grosvenor Arch) but Shakespeare Arch is a smooth connection between points. I continue on to complete the loop and it soon becomes apparent that the freeway trail only exists to the arch as the trail narrows to a single track. Cutting diagonally along the hillside soon the Sentinel comes into view. 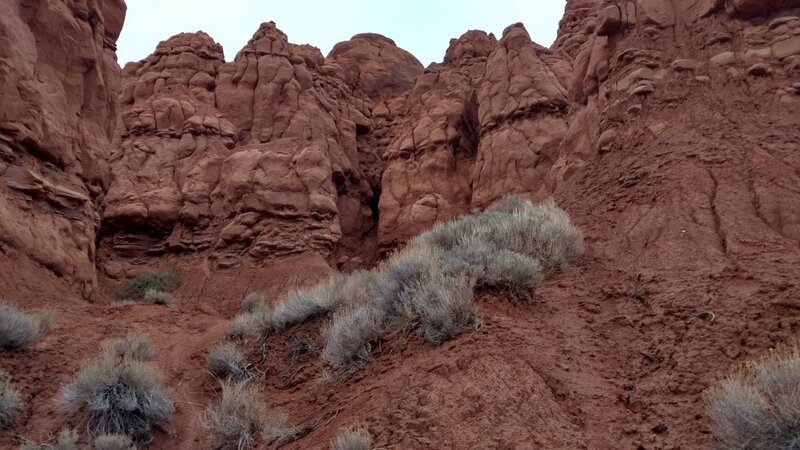 A massive sedimentary pipe rises out of a wash in this small canyon 180 degrees from the trailhead. It is at least 100 feet tall with a circumference of at least half that. It's white cement type structure is picking up the faint light and reflecting it in comparison to it's dark red neighboring cliffs. The trail drops directly to its base and up the other side. It is massive. I continue to follow the single track trail as it loops around the bluff. Having circled about 3/4 of the hill I decide to follow the "slickrock cutoff" trail at the juncture. I love slickrock hiking and dusted the loose sand off the bottom of my shoes to gain traction in the carved moki steps leading onto the slickrock hump. Following the cairns and rock arrows the slickrock cutoff direction of travel is back along the ridge and I am elated to see the Sentinel spire raising above the rocky dryfall. Things are wet so I use caution as I move along the sand and slickrock ledge following the trail. The trail is doubling back and I soon spot the tiny gap of Shakespeare Arch. In dry conditions one could get fairly close to the upper supports, but it is called "slickrock" for a reason and I stay away from the edge. Dropping off the sandy leading edge of the knoll it is getting dark. I work my way down the trail and back to my waiting vehicle. It wasn't a ranked peak that I just bagged, but it was a beautiful experience.